For much of the season my brother and I spend our time fishing rivers. 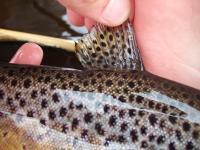 Our choice of tactics is usually pretty simple: a dry fly. The fly doesn’t really change much. During the day a biggish DHE or sedge, later on perhaps an F-fly, and towards evening small spinners can be useful. We keep it pretty straight forward, preferring to concentrate on covering good water with careful presentation. I think our loch fishing style has developed over the last couple of years to broadly reflect this kind of approach. 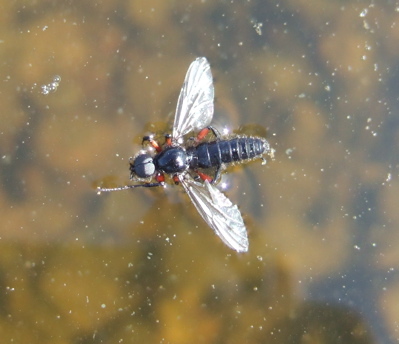 There has been so much written about the fine art of presenting a fly to a brownie in a loch that in the past we have tended to find ourselves rather overwhelmed. In the early days this led to endless confusion and debate about the correct methods to use on a given day, and in the end we simply didn’t catch very many fish. These days we keep things really simple. If there’s a snowball’s chance in the Sahara we fish dry flies. I usually opt for a biggish sedge on the top dropper, with something like a Shipman’s buzzer on the point. 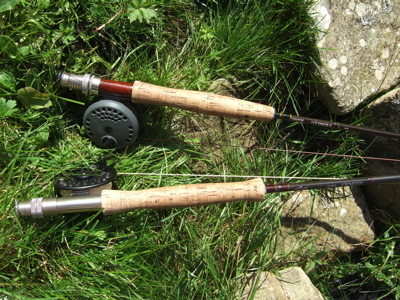 If the fish aren’t really up for it, I’ll exchange the Shipman’s for a traditional wet fly or snatcher and pull the flies to give them some action. This is then like fishing in the classic ‘short lining’ style, quick and (sometimes) exciting. I love this kind of setup because it’s really versatile and easy to switch around. On this year’s migration we occasionally tried something slightly different. I mentioned to my brother the ‘washing line’ technique of fishing midge pupae, and he rather liked the sound of it. 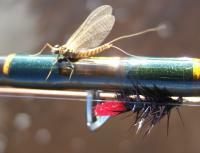 We tried a slightly simplified version with a midge pupa on the top dropper and a big sedge on the point. The cast was fished near static, with periodic retrieves. The idea is that during the ‘static’ phases the top dropper sinks slowly towards the bottom, gently pulling the dry fly back towards the fly line and covering a nice variety of water depths. During the brief ‘retrieve’ phase the cast is either figure-of-eighted or gently drawn back. 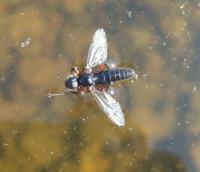 The dry fly acts like a surface anchor on the point allowing the pupa to rise enticingly up through the water column. It seems to provide a really nice way to imitate the up-and-down motion of natural midge pupae. The washing line method turned out to be a great way to fish, with a succession of trout from several lochs coming to both dry fly and pupa. 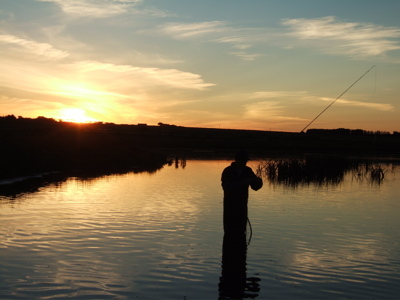 It perhaps lacks the raw energy of stripping wet flies back through a wave, but it certainly helps to provide a nice change of fishing style during quieter moments. It feels like a rather subtler technique, requiring more skill and concentration from the angler. I suppose this makes catching fish a little more psychologically rewarding. Going from an impromptu idea in the back of the caravan to a useful new method was really nice to see. And for Part II, next time… the fish. And the “Washing line” thing sounds interesting. How long a dropper were you using? Thanks Tom, nice to have you drop by. Well the dropper is about 6″ or so. Just enough to allow for a couple of fly changes. What is much more important is the distance between the dropper fly (or flies) and the point dry. Changing this is what allows you to control the range of depths you fish through. We typically used something like 3-6′. I used a washing line rig on Loch Corrib once, on a day when few fish appeared to be moving. With a large Wulff on the point and buzzers on the droppers, I had a great day. So I tried it with two different stages of Caddis emergers on a very slow part of the river this year during a Caddis hatch, as an experiment – but little success. I thought I would try it some more next season. A beautiful piece of writing there, I just love the curry analogy – it’s so true!! It’s strange how sometimes the most unlikely looking lochs can provide superb fishing. Just like a curry, you have to sample it to know what the tastiest bits are. A great way for you guys to end the season. Have you been after the grayling yet? Great Stuff, looking forward to Part Two. Mike, I really enjoyed your blog! 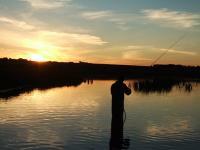 I’m not a fisherman but think it’s a great sport, with cool gear and great landscapes to enjoy your hobby doing. I think your panoramas are great. It’s my favorite and I kind of specialize in them.Keep up the great work.